Andrew Shulman, principal cellist with the Los Angeles Chamber Orchestra, enjoys a richly varied career as a recitalist, soloist, chamber musician, conductor, composer, and pedagogue, most recently as adjunct associate professor at the USC Thornton School of Music. Shulman has directed and performed a wide range of the cello literature with the Philharmonia Orchestra, the Academy of St. Martin-in-the-Fields, the City of Birmingham Symphony Orchestra, the Royal Liverpool Philharmonic Orchestra, the Los Angeles Philharmonic, the Utah Symphony, the Singapore Symphony and the Los Angeles Chamber Orchestra, among others. He has performed in such major venues as Amsterdam’s Concertgebouw, the Berliner Philharmonie, the Wiener Musikverein, London’s Wigmore Hall, Buckingham Palace, the Royal Festival Hall, the Royal Palace in Stockholm and the Hollywood Bowl. Shulman studied cello and composition at the Royal Academy and the Royal College of Music in London, later becoming the first British winner of the Piatigorsky Artist Award, an honor conferred by the New England Conservatory, Boston. Riccardo Muti appointed him the first chair of London’s Philharmonia Orchestra, and he has since performed as soloist with Sir Simon Rattle, Giuseppe Sinopoli, Semyon Bychkov, Franz Welser-Möst and Esa-Pekka Salonen, among others. Shulman has recorded over 25 CDs as a member of the Britten Quartet, while performing Vivaldi’s cello concertos for Virgin Classics, Janacek’s Pohadka for EMI, and a world-premiere recording of cello compositions by Frederick Delius. Shulman also has a career as a conductor, leading performances with the Haydn Chamber Orchestra, the Britten-Pears Orchestra, Royal College of Music Symphony Orchestra, RCM Chamber Orchestra and the Los Angeles Chamber Orchestra. 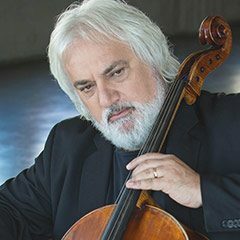 He has directed the Academy of St. Martin-in-the-Fields, the Los Angeles Chamber Orchestra and the London Chamber Orchestra in concerto performances from the solo cello chair. He has also conducted opera, including Mozart’s Le Nozze di Figaro and Cosi Fan Tutte, in new productions at the Theatre Royal, Bristol. Based in Los Angeles, Shulman served as principal cellist of the Los Angeles Philharmonic for several years, performed chamber music with such luminaries as Imogen Cooper, Jean Yves Thibaudet, John Ogden, Jeffrey Kahane, Stephen Hough, Vladimir Ashkenazy, Lynn Harrell, and Cho-Liang Lin, among many others, and had cello concertos written for him by Christopher Stone, Nathaniel Levisay and Maria Newman. His is a career of many dimensions, including extensive work in television and film music, ranging into concerts alongside the famed German rock/classical guitarist Uli Jon Roth, and his solo turn on Sir Elton John’s recording of Candle in the Wind, in tribute to Princess Diana and parenthetically the highest selling “single” of all time.